Did You Know That You Can Buy Specially Designed Cribs for Twins? Find Out About All The Twin Cribs Available For Your Twin Nursery. 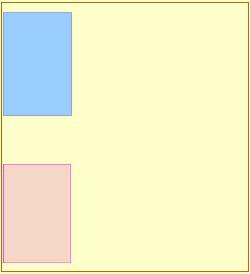 You could use a single crib initially and let your twins sleep together. Young babies are small and don't move around much when they sleep so one crib is more than big enough for both of them. 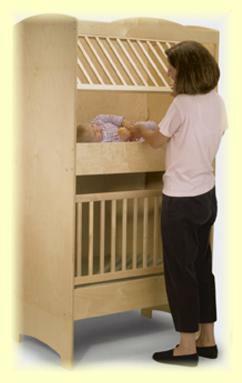 If you choose this option you will need to use a crib spacer to keep each twin on the right side of the crib. The advantage of twins sharing a crib is a reduced initial cost and the fact that research has shown that twins tend to sleep well when they are close to one another. However, as your twins get older and become more mobile they will begin to disturb one another. You will need to look at other cribs for twins to avoid sleepless nights. If your budget is taking strain, the bedside crib is a cost-effective short-term crib for twins. Bedside cribs are big enough to accommodate two newborns side-by-side. 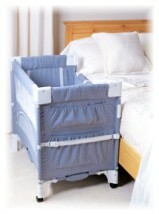 You can find out more about bedside cribs here. 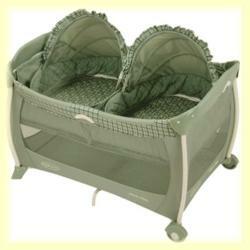 Another short-term twin crib, the Graco Pack 'n Play Playard is a playard with twin bassinets. Obviously the bonus with this temporary solution is that you end up with a playard that you can actually use after your twins are too big to fit in the bassinets. It's a good way to spread the costs out a bit, and I think it's really cute! There are a few specially designed cribs for twins available. Some of them are no longer for sale at major retailers but they are still available on the secondhand market so they will be mentioned here as well. If you want to make a statement then the Little Miss Liberty Duetta Round Crib Mate Twin Crib} is the right twin crib for you. It features four different canopy configurations - choose the one that suits you best. 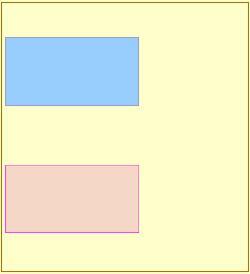 You can also link an extra one or two units to this twin crib if you are having triplets or quadruplets. The mattresses are included but you will need to buy round crib bedding to finish off the dramatic effect created by this crib for twins! The Double-Decker Twin Crib takes up much less floor space than any of the other twin crib options, and it's also one of the least expensive - mattresses are included. These cribs are stacked, one on top of the other like bunk beds - one baby on top, one on the bottom. You slide the wooden rails up to open the crib and take baby out. A metal latch fastens automatically when the slats are closed. It's a clever design, and worth looking at if you have a smaller nursery. This crib for twins is manufactured in New Zealand but is now available in the US through Kiwi Kid LLC. This crib is basically an extra-long rectangular crib with a removable clear lucite panel so that twins can see one another. The cribs can be converted to two single beds for toddlers, which is useful, however the non-standard dimensions of this twin crib will mean that it is difficult to buy bedding for it. 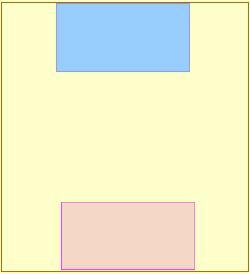 You may be better off with two single cribs that can be rearranged in the nursery if required. 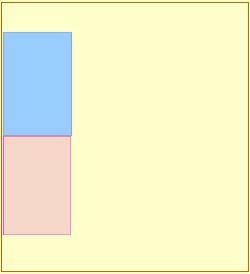 The Twin Corner Crib is L-shaped with two cribs joined together at one corner. It was formerly available from Morethanone.com but they went out of business. 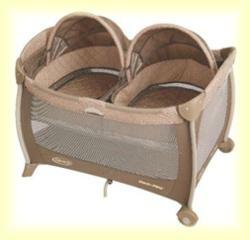 The Baby Trilogy Corner Crib is wedge shaped and you can put two together to form a semi-circle. You may be able to obtain either of these twin cribs on the second hand market. 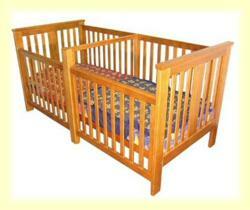 Two standard cribs will usually cost less than one of the specially designed twin cribs. 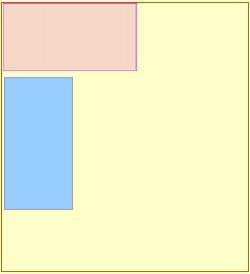 You have far more flexibility in terms of lay out. Buying both cribs together ensures that you will have matching twin cribs. If you buy only one now for your twins to share, with the intention of buying another later, there is a slim chance that you won't be able to match them up due to discontinuation of your crib model. Many retailers will give you a discount for buying two baby cribs at once. You can buy convertible cribs and use them later as your twins graduate to toddlerhood. As mentioned above, one of the disadvantages of buying two standard cribs for twins is the space that they take up. One way to get around this is to opt for two mini cribs instead. 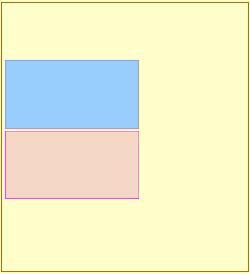 I hope the information on this page will help you to find the cribs for twins that will best suit your twin nursery. 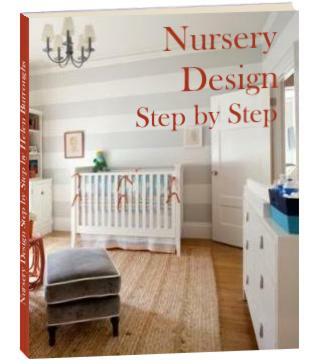 Don't forget to visit the twin nursery pictures gallery for design inspiration for decorating a nursery for twins. Not sure how you're going to cope with twins? This book is a simple practical, pick-up-and-read guide to make your life with twins a joy and a little less of a relentless struggle. It's a book filled with do's, not don'ts. 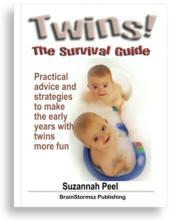 The tips in TWINS: THE SURVIVAL GUIDE are all practical and all twin specific. Simple tools and tricks that simply work, and work for managing twins, not singletons. Many twins books, even those written by mothers of twins, slip back into the 'singleton' groove after a few chapters, describing problems and solutions applicable to any baby. This is not what this book is for. This book is to help you solve the issues relevant to having twins - which is a very, very different deal to having one baby, or even two or three one-at-a-time children close in age. If you are preparing for the birth of twins, or you already have twins and want to make your life easier, check out this book now. Click Here! for help from a mom of twins!